« Review: Marriage: Whose Dream? It affects our sisters in Christ. It affects brothers in Christ too. Often the world tells us that the world’s latest fad of what is beautiful is more important than other things. Things such as character, virtue and a genuine spiritual life with God. The impact of the world’s idea of beauty affects how believers view themselves; it can rob some Christians of their joy that is rooted in their identity in Christ when they no longer focus on Christ but instead focus on how they measure up to the world’s standard of beauty for their self-worth and dignity. While beauty does have its place in life yet to value it in such a way as to rob one’s joy in Christ ought not be for the Christian. Of course the world’s emphasis of the priority of beauty affect how single Christians search for a spouse as well. Yes its true. That’s the principle taught in Proverbs 31:30. Face without works is dead, or any other part of the body of a person that one cherish as physically attractive. We all have heard the idiomatic saying “all dressed up and nowhere to go” but physical beauty without the fruits of godly virtue is like a gift box that’s all wrapped up but with nothing inside; its all about the packaging with nothing else beyond that. But without any content the packaging becomes meaningless; likewise beauty without the accompaniment of the fear of the Lord and the fruit of the Spirit is meaningless. No wonder Proverbs 31:30 say beauty is vain. Actually it is worst than that: the absence of godly virtues means sin will take its place and sin if we understand the sinfulness of sin, is ugly. Moral ugliness is the worst kind of ugliness. Think of the person who superficially is attractive according to the world’s standard but who later turn out was a terrible person in how they treat others. Suddenly that person becomes repugnant with their sins. The rest of the Bible tells us that sin separate us from God which is a spiritual death that will one day culminate in the second great death, the judgement of God. Yet what will profit someone who gain the whole world’s attention by their physical beauty if they lose their very soul? 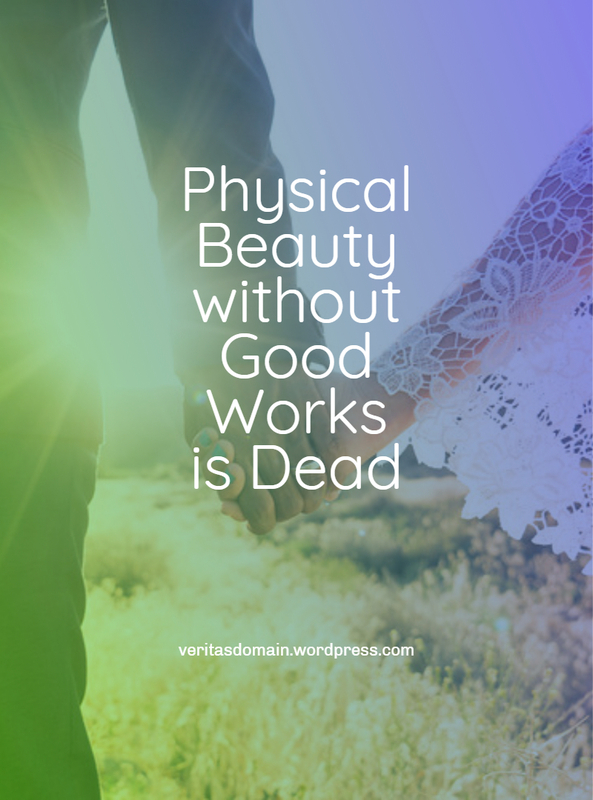 It is true: Physical Beauty without Good Works is Dead. For the Christian the ugliest we will ever be both morally and physically, will be on this side of eternity. After we die we will be without sin and reside in a glorified body and will become beautiful beyond anything anyone can possibly imagine. Yet when we understand the doctrine of sanctification that God is working in the lives of those He saved to make us holy we also know that God has already begun beautifying us in a moral and spiritual sense on this side of eternity. And that changes everything for the believers and courtship. Perhaps in the beginning a brother in the Lord originally saw a sister as wall flower. But through bits and pieces of information at the church he gets to know her a little more and also discovers her godliness. If he’s a Christian that loves God that would be an encouraging thing for him to discover simply as a brother in Christ. So every time he sees her physically he’s reminded of what he knows of her spiritually. Whatever her unique physical appearance is, when he sees her it signals to him of who she is morally and spiritually. He’s genuinely happy to see her. Sometimes God uses that to lead someone to consider the possibility of a relationship heading towards marriage. Her features become important to him. And when that person does take an interests in that sister in the Lord he should realize that he’s begun catching just a small glimpse of her beauty (moral and spiritual) that’s going to be fully manifested in eternity. on October 26, 2018 at 4:02 am | Reply Μιχαήλ (Michael) | A disciple of the Way of Jesus! This message is so very much needed. Thanks for speaking the truth. Blessings, grace and peace from King Jesus. Thank you Michael for your encouraging comment. I also want to thank you for sharing this on Twitter and I plan to eventually get around to retweeting that, appreciate the promotion. I hope it would encourage Christians to think more biblically concerning beauty and character especially those not yet married whom I have a heavy heart for as a pastor. “Face without works is dead”–brilliant! Love it! Ah you read it all the way and caught that! Thanks also for the reblog, how is your wife doing? If that was a typo, the Lord gave you a gift. It was a great turn of phrase. No drama at the doctor’s today, thank you, Father. I’ll blog about it in a few minutes. Great post! Praise God for taking his chosen people to Heaven to live with Him forever!! Amen! What a Great Lover He is! All other love flows from God’s example! Thanks for reblogging this post on both RG Studios and Glymre Tales! My pleasure, Jim! Thanks for posting it! So well written, this is beautiful. Excellent post Jim and I couldn’t agree with you more. I’ll be reposting this also. Grace and blessings! Good lesson, Jimmy! After spending 4 days in NYC I can vouch that humanity chases after a shallow, false beauty. Glad to hear you vouching this truth! “Beautifully” stated brother Tom!